One of the main purposes of NASSCOM is to showcase the strength and direction of the Indian IT and BPO services economy. However, it's not only about the heritage Indian firms promoting their strengths, it's also a great venue for leading traditional Western-HQed service providers to brand themselves in India, to help them compete for the top talent. Phil Fersht (CEO, HfS): Good afternoon, Aruna. Thanks for spending a bit of time with us today. Would you start by introducing yourself and how you got into this business? Aruna Jayanthi (CEO, Capgemini India): I started with Capgemini 15 years ago. I now run Capgemini India, and before that I ran global delivery for our outsourcing business. I was part of the core team that setup India, and when I joined there were 80 people in India. Today, we are a little over 55,000 (couldn’t say this then due to impending results announcements – will be good to mention the new headcount number as this is current view). Phil: 55,000. That’s a large number! Aruna: It is a large number. But in the end, it's not only numbers that matter; what matters is the value you deliver to your customers. Phil: Right... so would you talk a bit about your career progression and how you ended up leading the India business for Capgemini? Aruna: It's a strange story, because twice in my life I was tempted to get out of the industry and do something else, but somehow I got back in. I started my career with TCS, fresh out business school. I got trained in programming and project management, did account management, the works. Then I thought, that's enough, let me go try something else. And even though I did something completely different, I ended up in software for another in six years. Then I decided to get into consulting. So I joined Ernst & Young in India, and within three months it was acquired by Capgemini. At that time, Capgemini didn't have a presence in India, and the ex-Ernst & Young management consulting team became the core team that set it up and grew our offshore presence. Phil: Traditionally, Capgemini has had a very strong reputation in Europe and in parts of Asia. And more recently, it's been investing more in the U.S. and in India. And 55,000 is a big number, even though it’s not about the numbers. Would you talk about that operation and you know how it's running? And, what do you think is making it successful? Aruna: 70-percent of our business here is apps-oriented, and the rest is BPO and infrastructure-related services. And more than 90 percent of it is the traditional offshoring model. We do a little bit of work here for local Indian customers, but the bulk of the business is from customers in Europe, North America, and a little bit in Asia Pac. What differentiates us in terms of value? We’ve managed to blend the India advantage and the local onshore advantage. That local touch is sensitive, it’s important, and we’re very strong with it in Europe and increasingly in North America. Phil: Aruna, we spoke with several hundred services buyers for a study we’re producing. And the number one issue right now is talent and how to get more access to creative analytical capabilities, that sort of thing. How are you addressing that in India for Capgemini? What sort of people are you trying to hire? What's the training strategy? What are you doing to try and stay ahead of the talent game? Aruna: We’ve shifted our talent strategy in the past year and a half. Originally, we focused on lateral recruitment, meaning recruiting experienced hires from the industry. But in the last 18 months, we’ve started hiring far more fresh graduates. The reason for it is twofold. First, there really aren’t many people already in industry that have experience in the new technology areas we want to build on. They just don’t exist. But I visit university campuses regularly, and look at the stuff they are doing in their labs. They have access to almost all the new technologies, as they get all the licenses at almost no cost. And the students are playing around with cool stuff, which is what we want. Of course, we continue with lateral recruitment when it’s appropriate. That's our shift in terms of where we get our recruits. The second shift is in terms of the skills we’re looking for. The Internet of Things, embedded systems, wearables, big data…now we’re focusing on analytics plus business skills. So while engineers were formerly our typical recruits, I think math graduates who have done a bit of business school are actually better. Phil: So the theme of this year’s NASSCOM was "digital", at a very high level. And an early takeaway of ours was that probably half of the service providers here get it. They know what's happening, and they are figuring out what they need to do to get ahead of the curve. The other half they are like deer in headlights. How do you think India is going to make the shift, and do you think there is going to be some collateral damage on the way here? Aruna: Phil - there is bound to be. My view is that when you look at digital, it's not about technology. The role of the provider itself is changing. The question is, who understands the shifting role of the provider and how do they see it? Are we strong enough to understand the emerging digital agency, and the fact that if you are going to work on the customer side of it you better understand that side of the business? Is my role to write a program or code a system for somebody? Or is my role to provide a solution for a problem that they have? So if I take the latter approach of it’s my job is to provide a solution that gives the customer value, then I start to look at building different sets of skills altogether, right? I would start to look at building more consulting skills, more domain skills. My job then becomes an aggregator or an integrator role, as opposed to a software developer role. And I think for me that's far more important. Providers that understand that shift will do well. Phil: So, if you were to look out five years to 2020, what do you think we will be talking about? Aruna: I think we’ll still have a large digital element, but we won’t be talking software or applications anymore. The content will be far more business-focused than IT-focused. Also, I think the definition of the service provider will change. To me, the start-ups will become far more important, and it could be an aggregation of much smaller companies. We may even see a completely different set of providers. Phil: One final question, Aruna. If you were crowned the Empress of the Indian services industry for one week, what would you change? Aruna: I would change our positioning. Let’s use cars designed in Germany as an analogy. We talk about German engineering and how great it is, but we never talk about where the cars are manufactured (which I think is most often Mexico.) We just say it's German engineering. What I would really aim for is that we say, “It's Indian designed software” or Indian whatever. That's the value that we need to rebrand ourselves to. It could be delivered from anywhere in the world. But the branding that we need to get to is that this is Indian IT. It is a solution conceptualized in India. Phil: Precise and to the point, Aruna! Thanks for sharing your insights with our readers - it's been great to meet you. 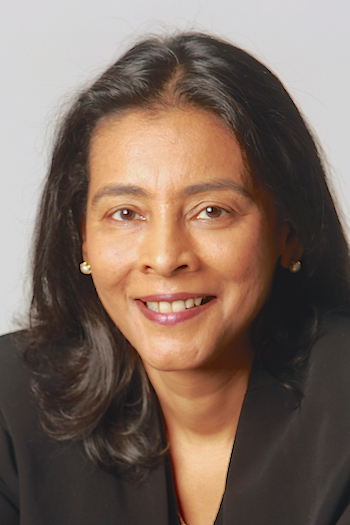 Aruna Jayanthi (pictured) is the CEO, Capgemini India. You can view her bio here. Phil and Aruna - a very informative discussion, thanks for sharing. There seems to be a bit of a dichotomy here - positioning India as the premier IT brand, but the focus with digital is more about solving business problems than IT problems. @Joe - as IT matures, the basic provisioning of it becomes more the plumbing behind the business solution. For example, who cares where data centers are located, which programing language was used to knit together APIs etc. However, the application of technology solutions to help solve business problems is becoming front and centre for so many business models today. It's about intelligently linking/automating processes to extract more meaningful data, and it's about using this data to provide more products/services and insights to end clients. For example, I learned recently that PayPal now offers credit to clients, independent of commercial banking systems, as it has such great data on their customer spending over long periods, and is able to make its own decisions on their credit-worthiness and what levels of lending are appropriate. I personally view India as having great data/analytics skills and potential - it's in their DNA! If they can make this shift from programming to maths, from input-based process thinking to more creating outcomes-based-orthogonal thinking, then it has a great chance of being perceived as a business analytics brand, underpinned by a strong IT backbone. Comes across as a grounded person. No outrageous claims. No attention-grabbing soundbytes. And yes, outside the headlights that TCS, Genpact, WNS etc. seem to be in, Capgemini have built up a valuable franchise.